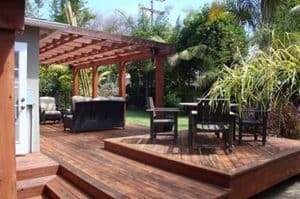 And with Spring and Summer seems to always be right around the corner, adding a new deck or refurbishing your current one could be the most popular place for your friends and family to enjoy. Determining what you want to do with your deck, what is your budget to get the best return on investment. Adding a deck or refurbishing your current one is only a fraction of the cost of indoor living space making it an asset if you should sell your home. 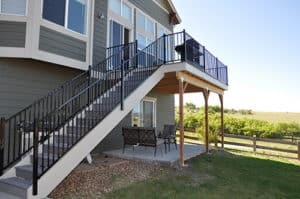 Since your deck will be used a lot in the spring, summer and fall having it laid out to where it does not take over your backyard, but still fits all of your needs. We will work with you to design the perfect deck for your lifestyle, taste, and budget. Whether your deck is a small single-level, for an afternoon barbecue, or a multi-tiered configuration that follows the contour of your property, we can design the perfect deck for you. Whenever we meet with a customer about a deck, we want to know what you would like to have done, as well as discussing the different design options to consider. If you have an existing deck and would just like it repaired or expanded, we can help with that too. Let us show you how we can help make your new deck and patio area into a reality. To schedule a free consultation, please give us a call at (303) 829-3374, or fill-out the form to "Get a Quote" and we will get back with you right away to schedule a time to meet.